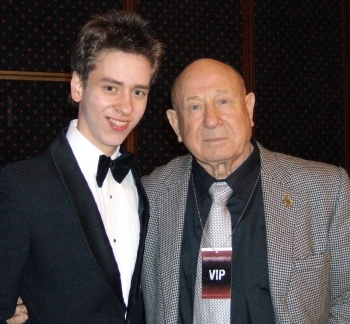 I met the great Soviet cosmonaut Alexei Leonov (the first man to walk in space) at the Autographica event held at the Birmingham Hilton in April 2008. 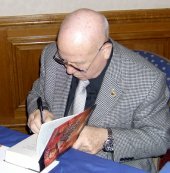 He signed a photograph for me, and also my copy of his book Two Sides of the Moon. 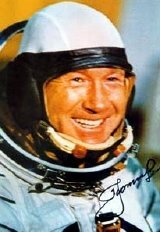 Leonov was one of the twenty air force pilots selected in 1960 to become part of the first cosmonaut group to fly in the planned Vostok programme which put the first man (Yuri Gagarin) in space in 1961. 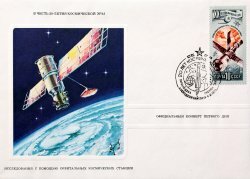 'Voskhod' programme. 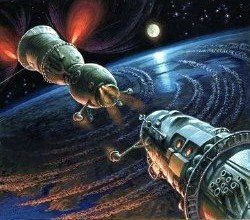 These flights were clearly aimed at providing Russian 'firsts' in space exploration, and were achieved with some disregard to safety! 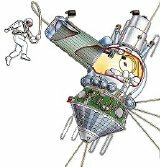 12 minutes and 9 seconds outside the spacecraft to which he was tethered by a 5.35 metre safety line. 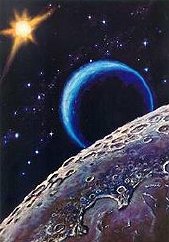 He pushed away from the craft and drifted more than 5 metres away before reeling himself back in. 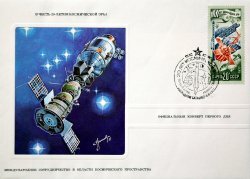 Voskhod's partly open hatch! 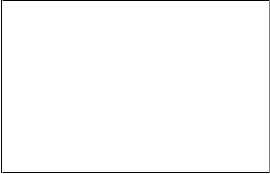 The crew spent two nights in the wild before they were eventually rescued! 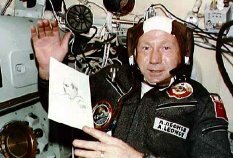 (The nightmare of Voskhod 2 was told by Leonov here). 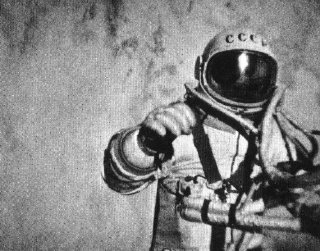 This should have been the start of several more missions for Leonov, but for various reasons none went ahead. 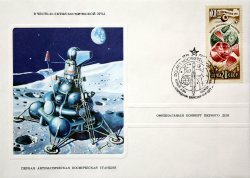 was also selected to be the first Soviet person to land on the Moon, aboard the Soyuz LOK spacecraft, but that was cancelled. 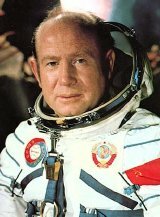 In 1971, Leonov was to have been commander of the ill-fated Soyuz 11 mission to the manned space station Salyut 1, which killed all three cosmonauts on board. 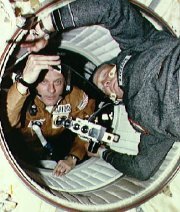 The back-up crew went instead because Kubasov from the original crew was thought to have TB. 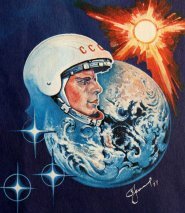 Brezhnev wanted to prove that the United States and the Soviet Union could cooperate in space. 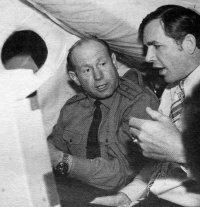 spacecraft carrying its three-man crew of Tom Stafford, Deke Slayton and Vance Brand. 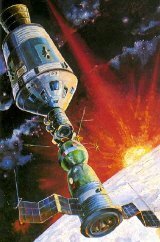 This event successfully tested a rendezvous & universal docking system. 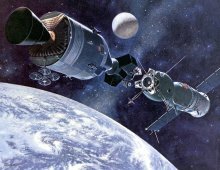 However, a worsening of the Soviet - American détente soon afterwards meant that it would be the last such docking for 20 years. 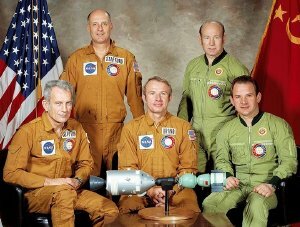 Click here for an excellent account of the time when the American & Russian spacemen met, and shook hands for the first time. 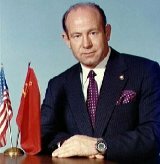 Following the Apollo-Soyuz Test Project, Leonov was promoted to the rank of Major General. 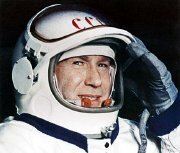 driver was killed, but Leonov managed to survive the shooting by crouching behind the seat. 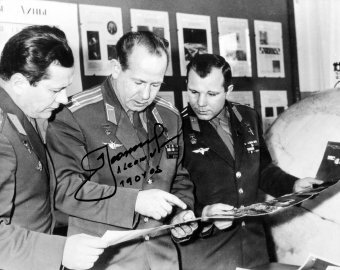 From 1976 to 1982, Leonov was the deputy director of the Yuri Gagarin Cosmonaut Training Center at Star City (a military research and training facility near Moscow) where he oversaw crew training. 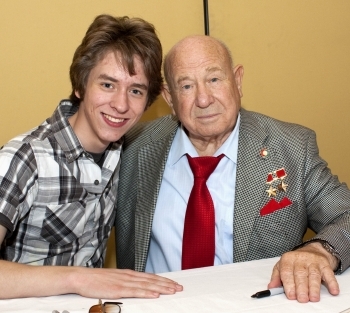 For his work in space, Alexei Leonov was awarded the 'Hero of the Soviet Union' twice, as well as the 'Order of Lenin', the highest civil decoration in Russia. 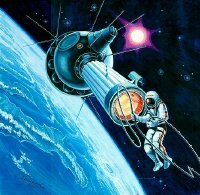 After serving as a cosmonaut, he became an investment banker, later becoming a vice president of Moscow's Alfa Bank. 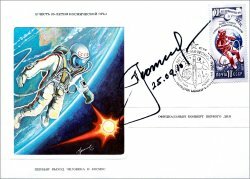 widely regarded as one of the best known space artists in the world, and his creations have been published in many books including his own volume called Earth and Space Painting. 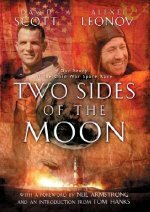 An unusual 'joint autobiography' Two Sides of the Moon was published in 2004. 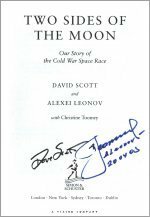 It is a brilliant book about the 'space race' between America and the Soviet Union, as seen through the eyes of both Dave Scott (commander of Apollo 15) and Alexei Leonov. 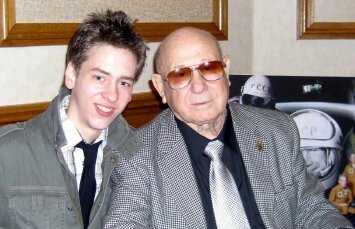 They write about their highs and lows, their great achievements, their disappointments and their sadness at lives lost. 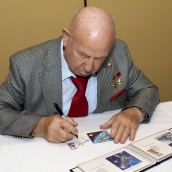 Scott and Leonov alternate chapters throughout this amazingly written book. 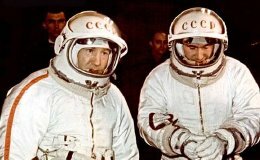 Leonov's wife Svetlana is a teacher, and they have two daughters, Viktoria and Oksana. 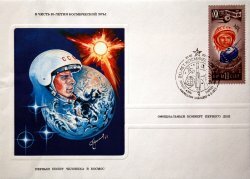 My set of USSR Official First Day Covers commemorating the 20th Anniversary of the Space Age. 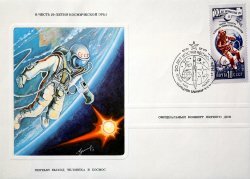 These stamps are all postmarked 4th October 1997, and the envelopes each show one of Alexei Leonov's paintings specially done by him to honour the 20th anniversary of the launching of the first sputnik. 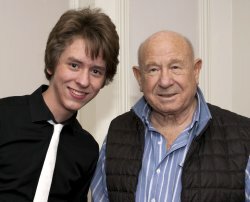 I met Alexei Leonov again at the Autographica event held at the Hilton Thistle hotel near Heathrow, in September 2010. 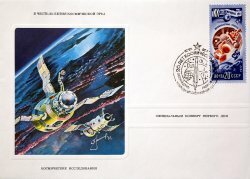 He signed my first day cover which depicts him making the first space walk.